US rap star Kanye West has been arrested on suspicion of vandalism after a row with a photographer at Los Angeles International Airport. News agency Associated Press said the incident happened before he cleared a security screening at the airport. An airport spokesman told BBC 1Xtra police also arrested the rapper’s bodyguard, who has not been identified. A camera valued at $10,000 (£5,709) had been broken, he said, adding police were talking to witnesses. 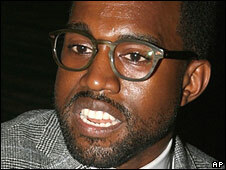 Mr West had been due to board an American Airlines flight when the incident occurred. Video of the incident was made public by US celebrity website TMZ.com. Airport spokesman Albert Rodriguez said: “West and the other man are currently in custody with airport police. Earlier this week, he performed at the MTV Music Video Awards in Los Angeles, a year after complaining about failing to win a single prize at the event. He has also been nominated for best international act at the UK’s Mobo awards.